Jose Fernandez quietly pieced together an excellent rookie campaign. But not many people are paid attention because he pitches in a stadium where an echo rings out whenever someone drops a peanut. Okay, it might not be quite that bad for the Marlins faithful, but it's far from good. It's likely going to take time for collectors to warm up to the young standout and get Jose Fernandez cards into a bigger spotlight. 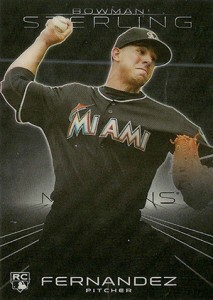 Shop for Jose Fernandez cards on eBay. 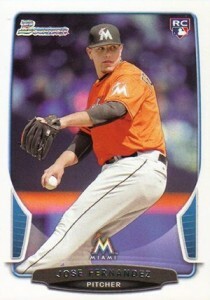 The Marlins picked Fernandez out of high school with the 14th overall pick in the 2011 draft. The fact that he plays for a lowly Miami squad that's primarily youngsters and cheap castaways certainly helped his ascension through to the majors. But Fernandez is proving that he belongs. Through the first half of the 2013 season, he posted an impressive ERA and was among the best in the National League in strikeouts per nine innings. Had he been playing for a big market team, Jose Fernandez cards would be scorching. At this point, they're doing well but without a ton of excitement. His first official rookie card came in 2013 Topps Series 2. 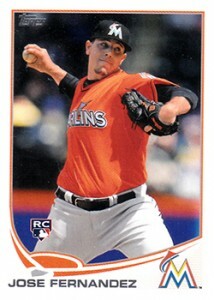 The first Jose Fernandez cards came out in 2011. 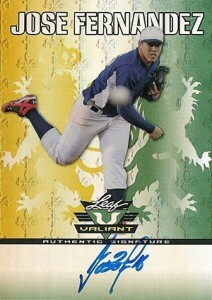 He appeared in Bowman Draft, Bowman Sterling, Leaf Metal Draft and Leaf Valiant. These cards, although popular, are considered prospect insert cards by definition. That shouldn't slow their popularity, especially when it comes to the Bowman Chrome Autograph. 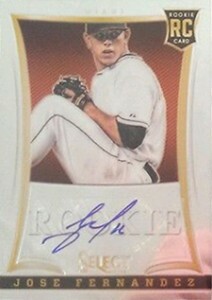 If Bowman Chrome is your thing, the 2011 Prospect Autograph is definitely the better route to go if you can afford it. However, if you're on a tighter budget and you want something with a bit of a premium feel, this is a solid choice. 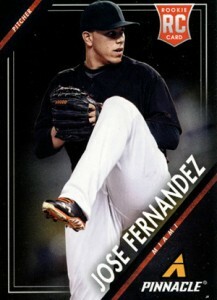 This is one of the most basic and cheapest Fernandez rookie cards. It has no flash, it's readily available and you should be able to find it for a buck or two. It's got a bit of flash, but most collectors are ripping 2013 Bowman Platinum for the prospects and autographs. 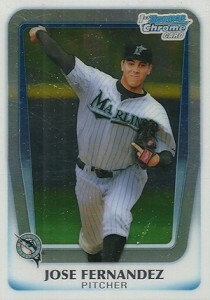 For those looking for Jose Fernandez rookie cards, it's pretty easy and inexpensive to swoop in and grab them. The big selling point of this card is its rarity. It's not serial numbered so print runs are speculation. But Bowman Sterling is loaded with autographs and very few base cards. Factor in the high price tag for packs and boxes and the math shows this is a relatively tough card as far as basic rookie cards. 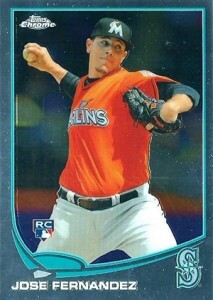 As far as high-end Jose Fernandez rookie card delights go, few can match what America's Pastime delivers. Inserted as a redemption, the final card should have an autograph and three memorabilia swatches. To top it off, it's a book card numbered to 99. This is another affordable option for those looking for a no-frills rookie that has a more upscale look. While the base version is cheap, the many Prizm parallel have more of a chase element. Licensed only by the MLBPA, Pinnacle doesn't have any MLB logos or marks. And while it wouldn't be a high-dollar card with them, it has somewhat limited appeal. Museum Collection parallels are a lot flashier (and still very affordable). With Pinnacle not being opened by as many people as similar Topps products, it might actually be a little tougher to find, although it's not rare. Inserted in packs as a redemption, the final card is now live. It features a chromium look and an autograph. It's also numbered to 750, which isn't altogether rare. Combine that with the fact that the signature is on a sticker and it represents an affordable option given what it offers. 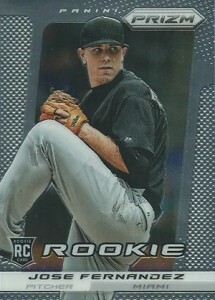 This is the first, and so far only, Jose Fernandez rookie card. It comes with a clean design and a fairly standard photo. It's cheap, normally costing only a dollar or two. Allen & Ginter is always popular with a wide range of collectors. But unless they're short prints, base cards don't normally command a lot of attention. The card has an old-fashioned feel to it, sticking with the tobacco card origins of the brand. 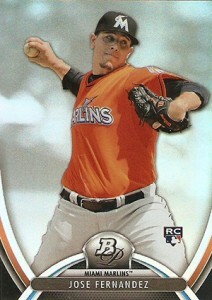 Fernandez also has several mini parallels in the release. 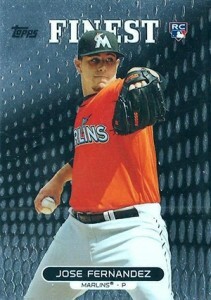 This card is overshadowed by Fernandez's autograph insert. It's designed much like the base card and features an on-card signature. As a result, the base set rookie card can be found cheaply. The design is a polarizing one to say the least. Like Topps Chrome, there's a lot more interest in the autograph insert than the official rookie card. There are also several levels of colored parallels to chase. 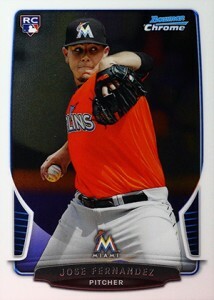 Inserted as part of the online-exclusive factory set, this isn't as easy to find as a lot of Fernandez's other basic rookies. That said, the print run appears to be significantly higher than 2012. This means that there's more supply and prices are softer in comparison. 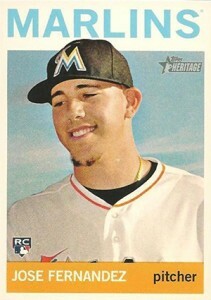 Originally distributed as an online-exclusive (following a early-bird preview at the 2013 National), the 2013 Topps Mini Jose Fernandez rookie card is a shrunken down version of the original. Over time, it should be much tougher to find than the regular Topps card. If you're looking for the most valuable Jose Fernandez card, this is it -- at least if you don't take rare parallels into account. 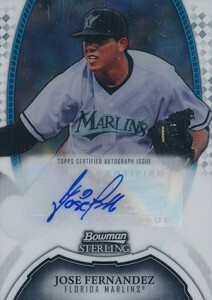 The 2011 Bowman Chrome Draft Jose Fernandez autograph comes with an on-card signatures and a clean design. It's still trading at moderate levels, far below a lot of other top-tier prospects. If the signed version is still out of your price range or you're looking to buy in bulk, there's nothing wrong with the basic 2011 Bowman Chrome Draft Jose Fernandez. It's cheap and readily available. Like all Bowman Chrome cards, there are lots of Refractors of varying rarities to make things a little more interesting. Despite coming from a brand that costs far more per box than Bowman Chrome Draft, the 2011 Bowman Sterling Jose Fernandez traded for noticeably less. Part of it is the sticker, part of it is the high cost of boxes that keep some people away and part of it is the lack of overall notoriety for the Bowman Sterling name -- especially when placed against Bowman Chrome. But for those who want an autograph and the logos, this could be a very enticing budget-minded option. 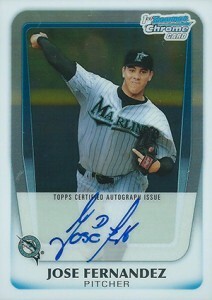 The 2011 Leaf Metal Draft Jose Fernandez is another autograph that can still be found fairly cheap. If you're not concerned about logos and licensing, it's got a nice on-card signature for about half the price of Bowman Chrome Draft. 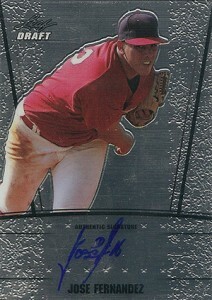 The 2011 Leaf Valiant Draft Jose Fernandez autograph is in much the same camp as the Leaf Metal Draft card. The lack of MLB logos means it trades at a discount. If the signature is the most important thing for you, here's another affordable option. Does anybody wants to buy it?